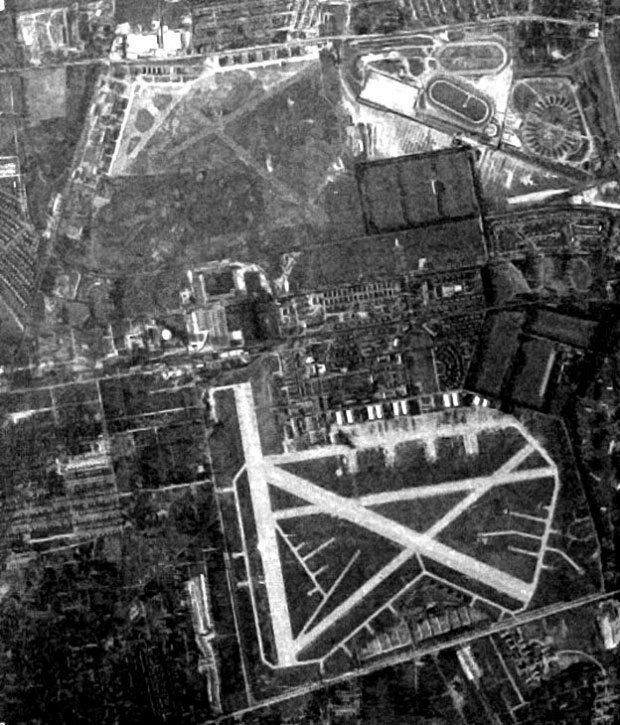 In my quest to discover Motor Parkway images over the last 11 years, I have uncovered many great aerials of nearby Mitchel Field Air Force Base taken from 1924 to the the present. 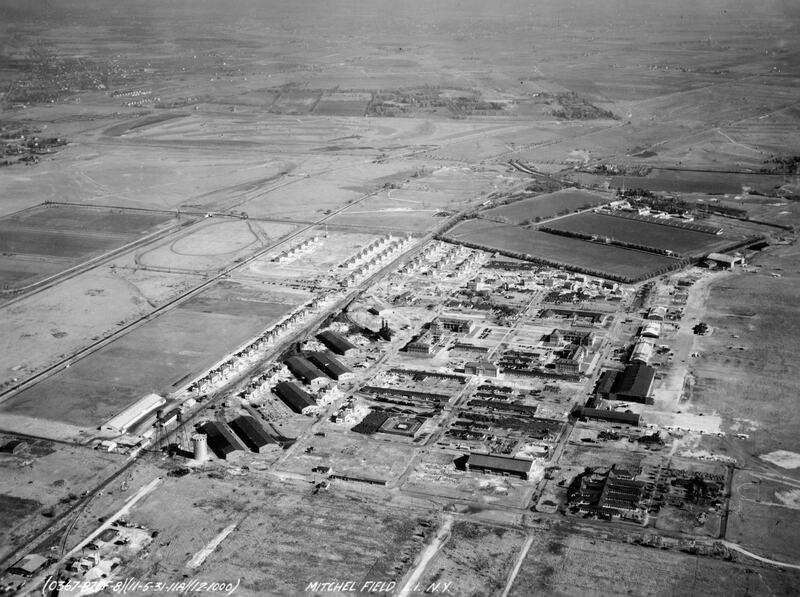 Placing these Mitchel Field aerials in chronological order shows how the airfield changed over the last 80 years. 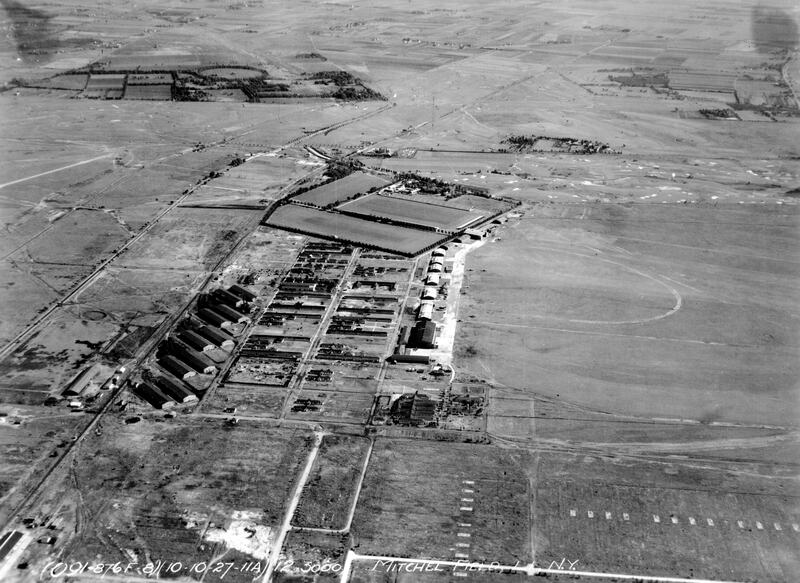 Most of these aerials are courtesy of the Cradle of Aviation and the Air Force archives. Find out how this site is linked to the 1972 classic film The Godfather. 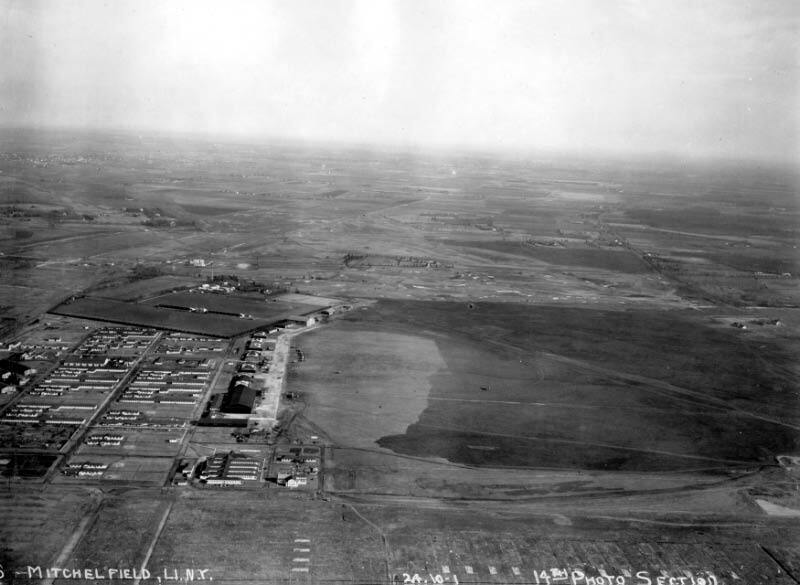 Mitchel Field was originally established in 1917 as Aviation Field #2 just south of Hazelhurst Field as a training and storage base. 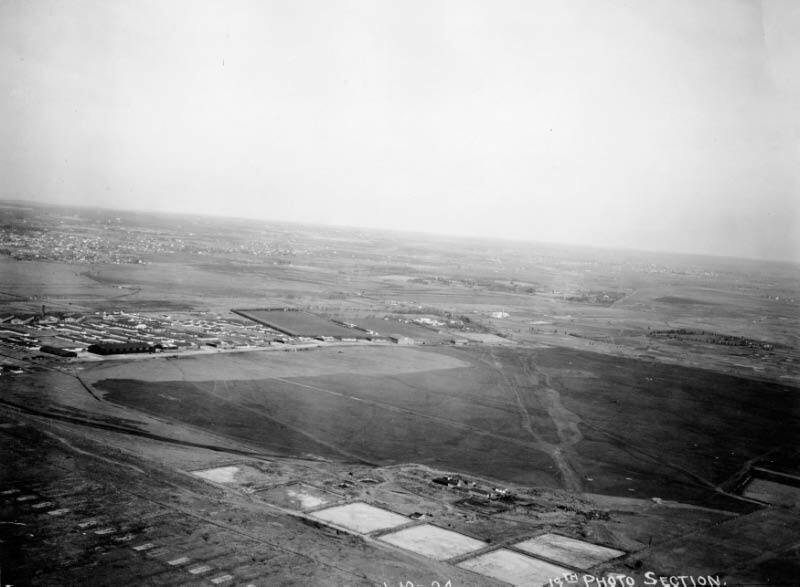 It was named Mitchel Field in July 1918 after former New York City Mayor John Purroy Mitchel, who was killed while training for the air service in Louisana. The Motor Parkway was less than one-half mile north of Mitchel Field. 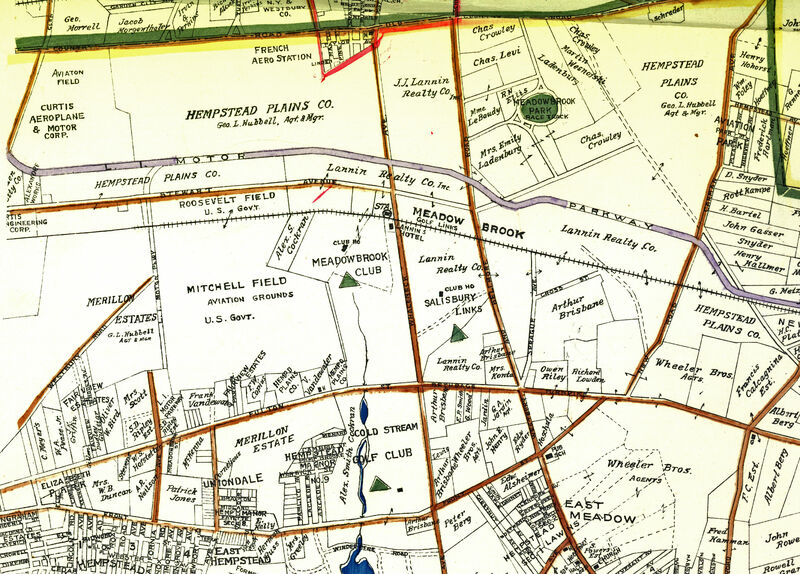 The "Hempstead Spur Road" to the west of Mitchel Field connecting the Motor Parkway with Fulton Street was never built. In this view looking east, the Motor Parkway was on the far right. 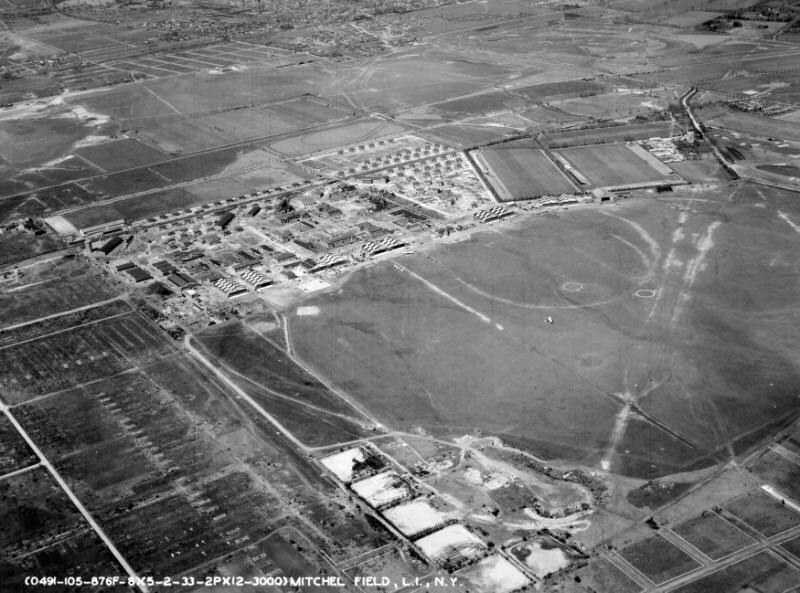 Mitchel Field was just a grassy field. 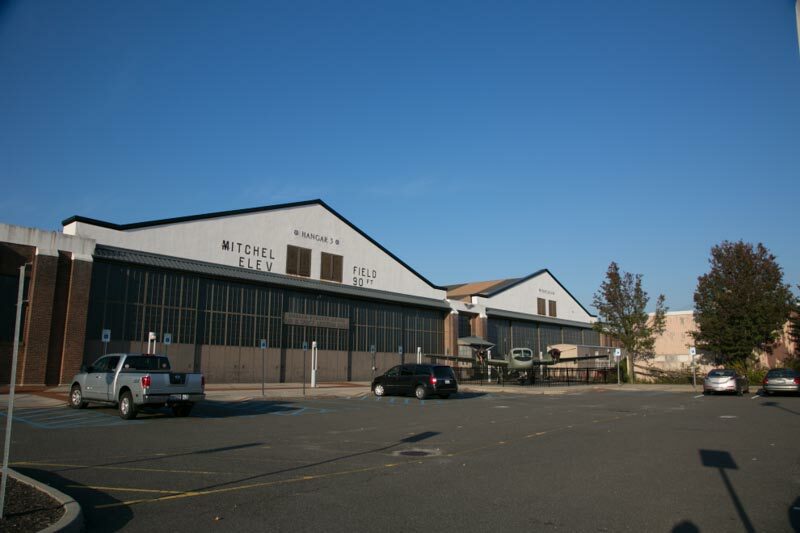 M I T C H E L was spelled out across the top of the original hangars. 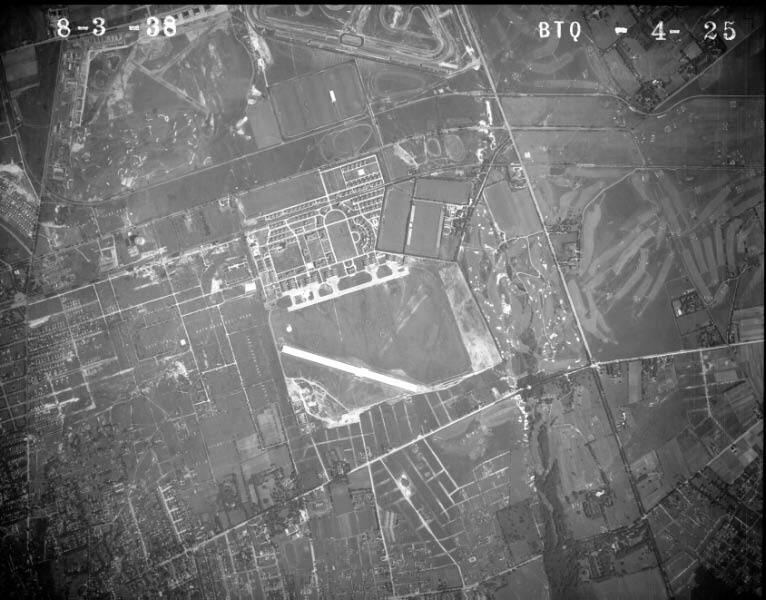 As commented below by Garry Hammond, the remains of the early Mitchel Field buildings can be seen along the right corner. 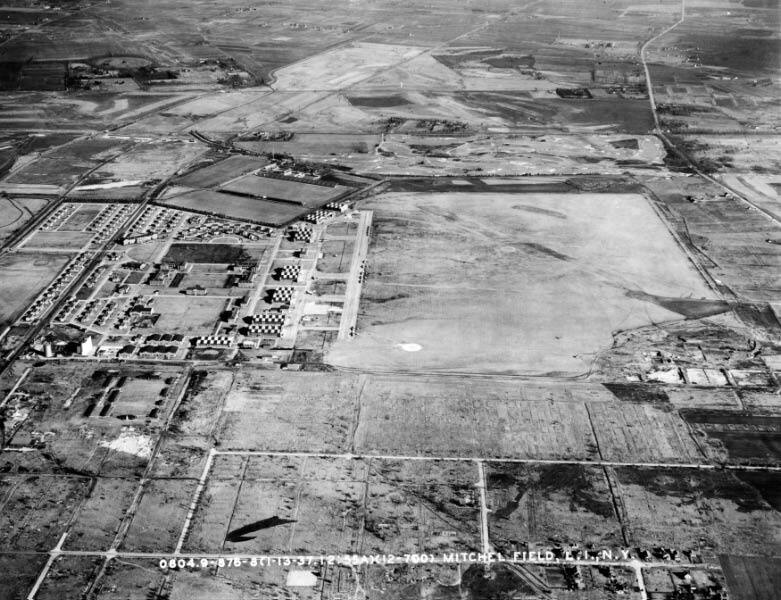 By 1931, the size of the field and number of buildings continued to expand. 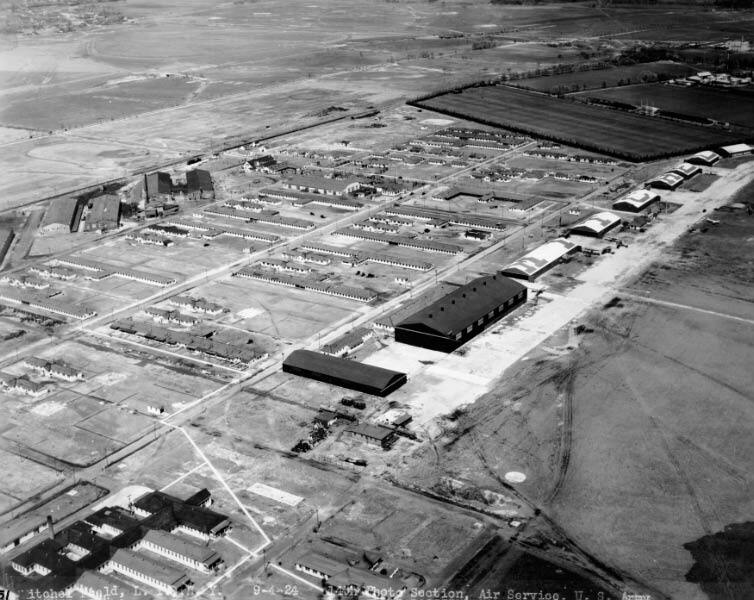 Note the new hangars, several are still standing today as part of the Cradle of Aviation and Nassau County Museum Row. This view was looking west with a great view of the original Meadow Brook Golf Club and one of the polo fields of the Meadow Brook Club. Merrick Avenue is across the bottom. 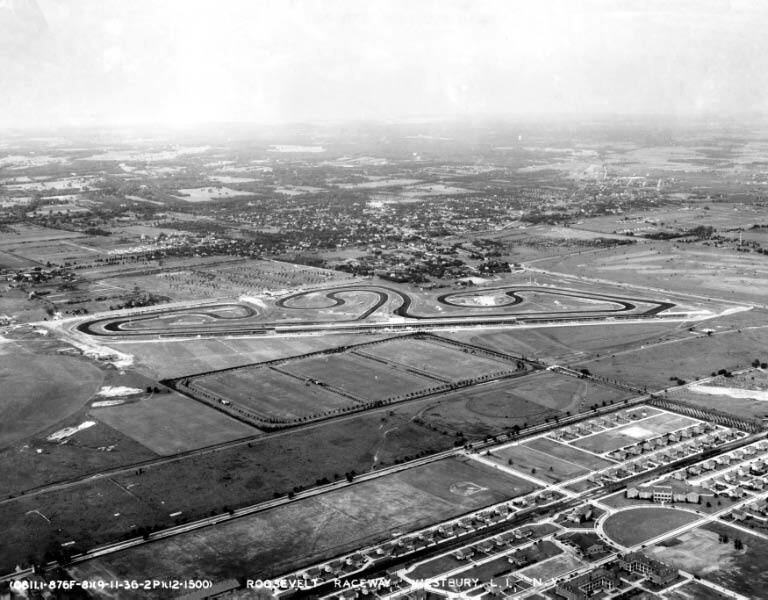 The newly constructed Roosevelt Raceway, the site of the 1936 and 1937 Vanderbilt Cup Races, was captured in this aerial. 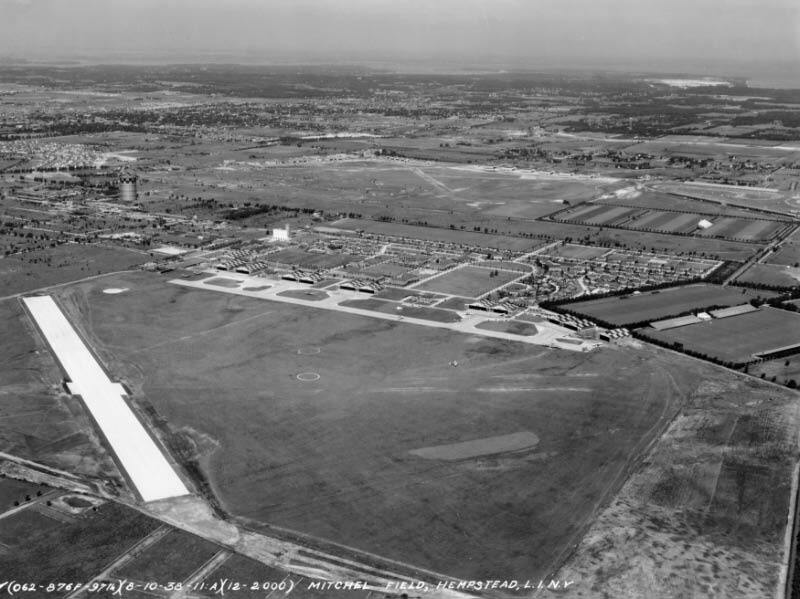 There was still no paved Mitchel Field runways in January 1937. The first concrete runway can be seen under construction. 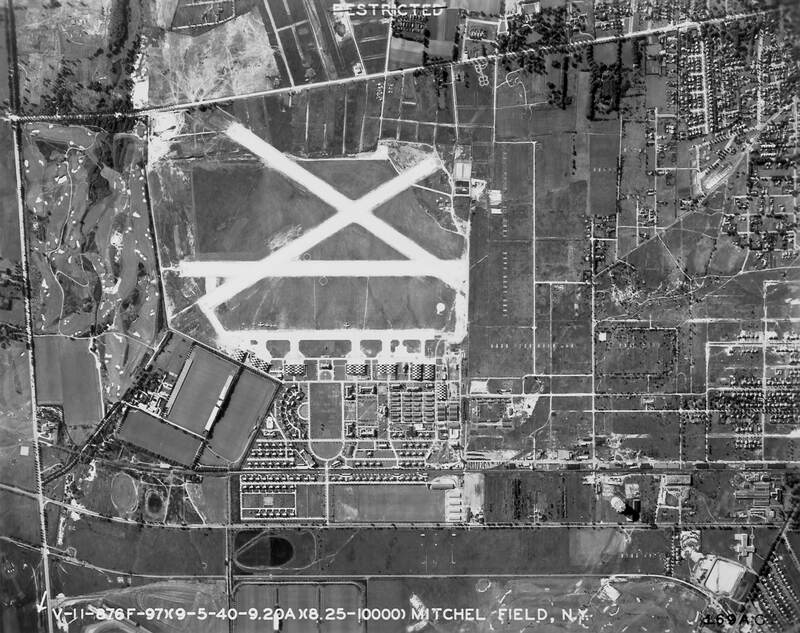 Note how close Roosevelt Field was to Mitchel Field. The second runway was being built. 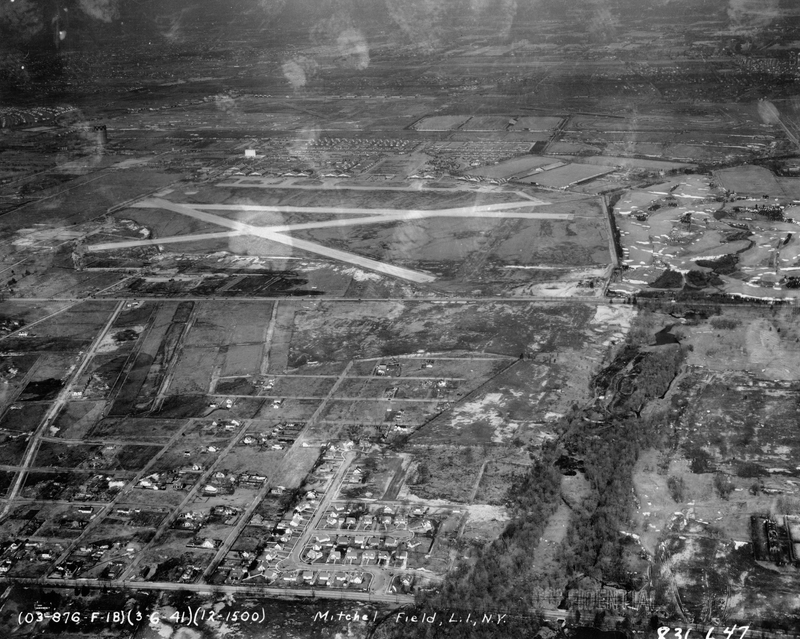 With war expanding throughout the world, Mitchel Field now had three runways. The closed Motor Parkway can be seen on the bottom of the aerial. The Motor Parkway bridges over Merrick Avenue and Clinton Road had already been taken down. 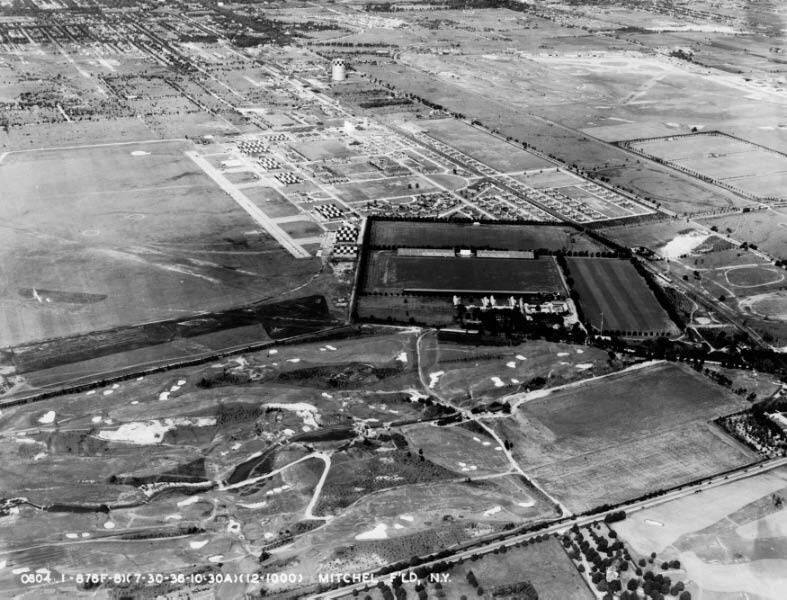 Looking north, the Meadow Brook Golf Club and Coldstream Golf Club were on the right. Front Street runs across the bottom of the aerial. 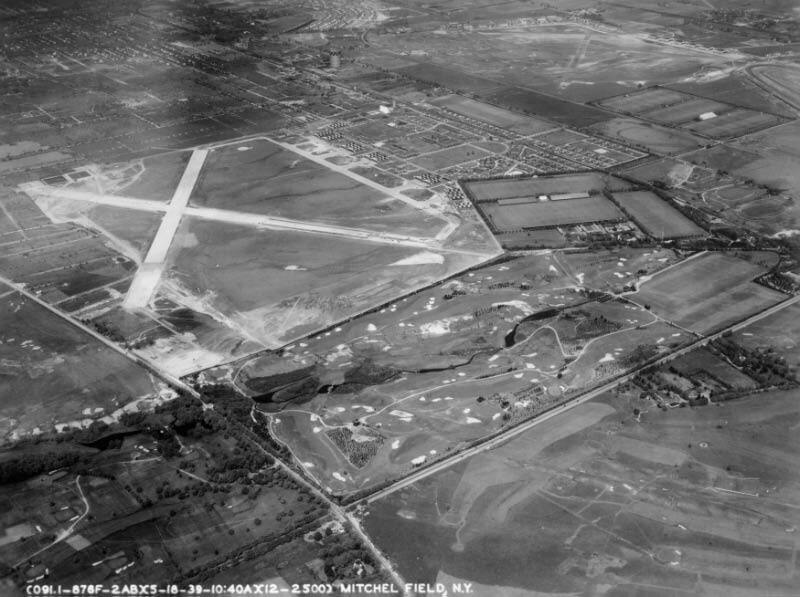 After 54 years of operation, Mitchel Field closed on April 15, 1961. 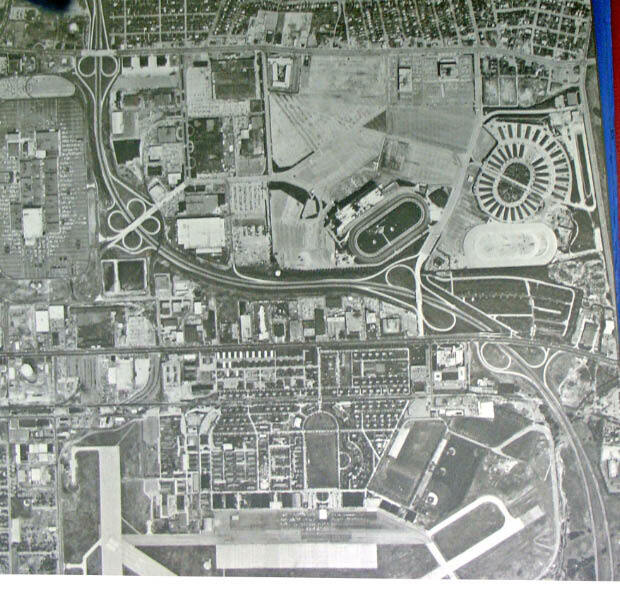 Note the Meadowbrook Parkway and Roosevelt Harness Racway. 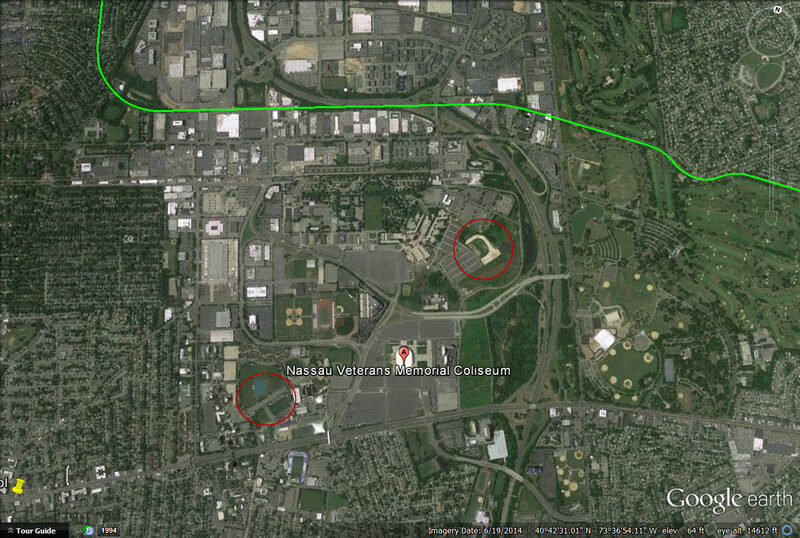 Today's Google Earth shows the Motor Parkway and the Mitchel Field area. Much of the property has been taken over by Nassau Community College, Hofstra University, Nassau Coliseum, Museum Row and office complexes. Note two sections of one runway still remain. 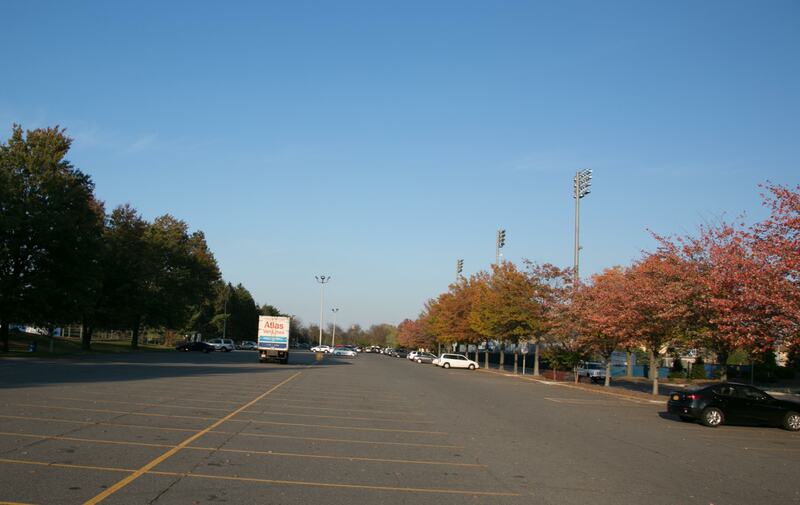 The southern section of the runway has been paved over and acts as a very long parking lot for Hofstra University. In the northern section, the original concrete runway remains in place. 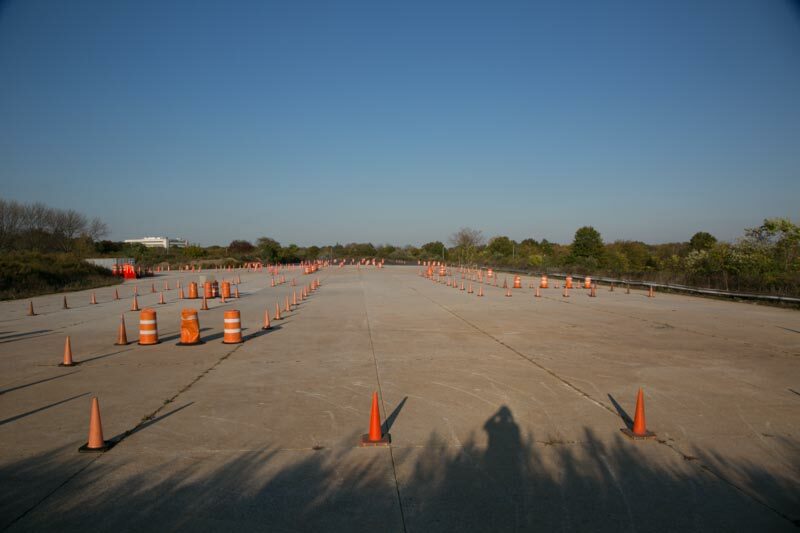 As commented below by Arthur Emerson, this area is currently used for Nassau County EVOC (Emergency Vehicles Operator Course) programs. In this very spot, a little bit of film history was made here 42 years ago. The famous Godfather death film scene of Sonny Corleone was shot here in 1972. 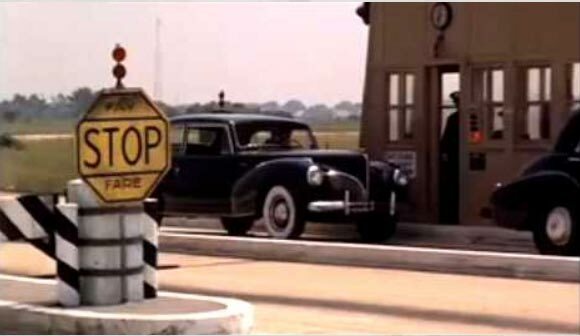 The TV tower for the Diocese of Rockville Center can be seen in the background above Sonny Corleone's ill-fated car. This is the Godfather film location and TV tower as seen today. It's a match! On Sunday, you will be able to see many classic cars ,including Chrysler's Chrysler, in front of the Cradle of Aviation and the Mitchel Field hangars. 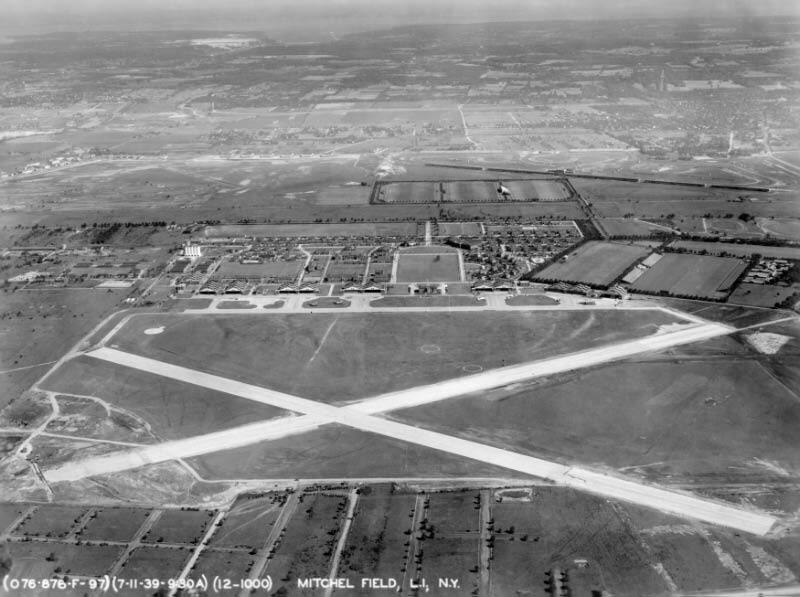 Link to more information on Mitchel Field and Long Island's abandoned airfields. 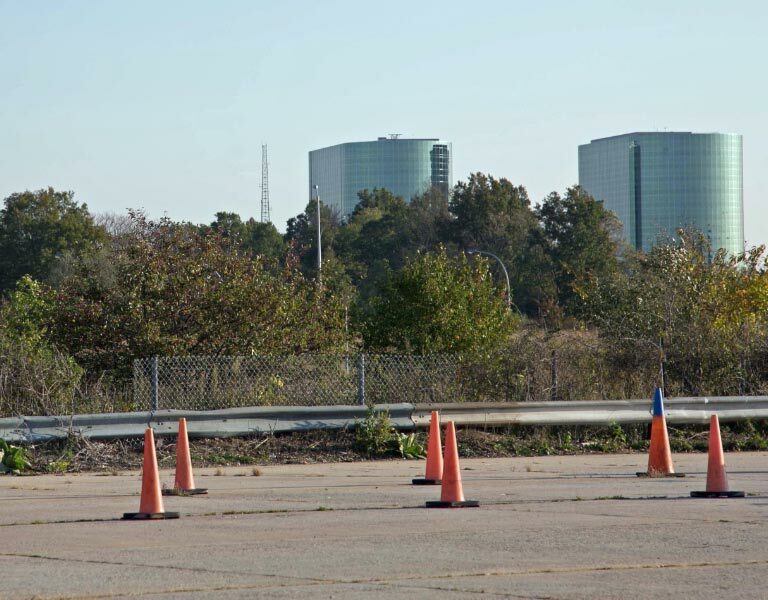 Just as a correction, the northern piece of runway off of the NCCC access road is actually being used for police EVOC driver training as far as I know—NOT a go-cart track Other groups would *love* to have access to that site for public motorsport events, but alas we are stuck with what’s left of Nassau Coliseum….. Thanks for the Mitchell Field presentation—it brought back some memories. In the late fifties and into the early sixties I spent some some time in that area. The father of a young lady I was dating was the food service director at the air force base so we had dinner there a couple of times. Also, I was taking evening classes toward a masters degree at Hofstra during that time so I was right across the street (Hempstead Turnpike) several evenings a week when the base was still in operation. 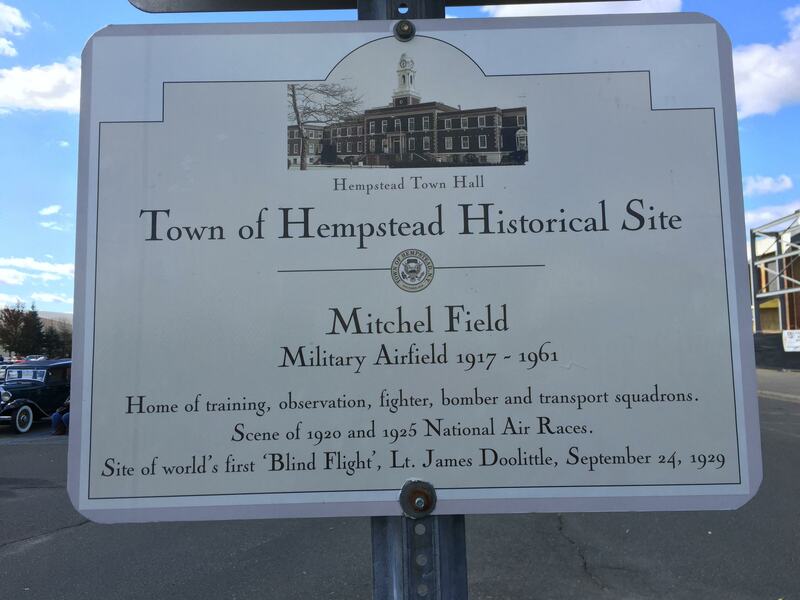 I grew up in W. Hempstead and remember riding with my father through Hempstead and past Mitchel Field on the way to the farm stands, which were in E. Meadow and what became Uniondale just before the building boom. Back then (the ‘40s & ‘50s) Mitchel was an active Army Air Force and USAF base. I remember seeing B-25 bombers flying over our heads coming in for a landing. Hofstra College, across Hempstead Tpke was just a small college at that time. Many of my fellow graduates from W. Hempstead High School went to either Hofstra or Adelphi after our graduation in 1955. I believe that the 1920’s photos don’t show foundations for new buildings, but are leftover remains of the now gone WWI buildings. Along the north side of Commercial Ave. still stood some wooden WWI vintage warehouses in the 1980’s, which slowly were destroyed by fire & replaced by newer brick/concrete structures. One of these seems to be on the lower left side of the Oct. 10, 1927 photo. I believe that Camp Mills had extended quite a distance to the east from Clinton St, where the Rainbow Division monument now stands, and ended close the Mitchel during the “Great War”. I believe photos do exist showing this. 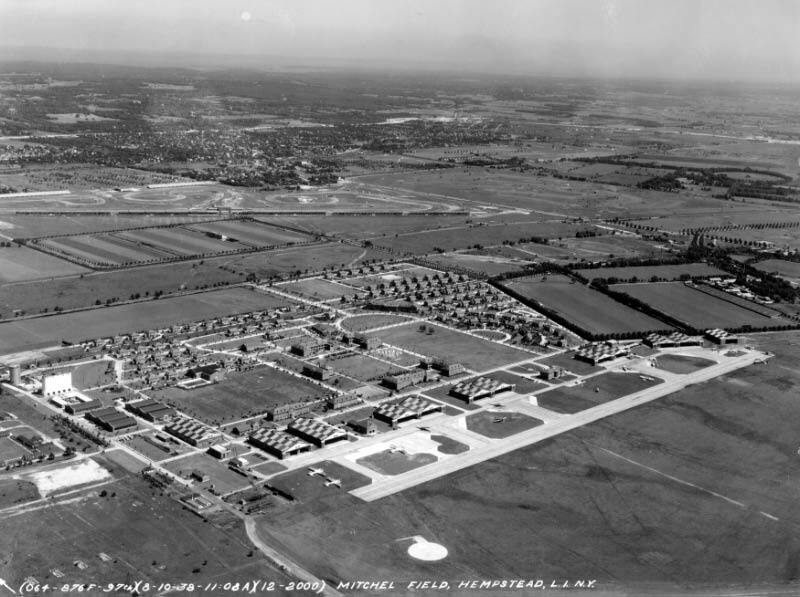 When was the duplex housing complex with central dining hall built for service men and their families? It was right next to the harness track at Roosevelt Raceway, and was used in 1965-1968 by Friends World Institute faculty and students. Is it visible on any of these maps? It was called Mitchell Gardens. My father, Mitchell Scott, was born on Mitchel Field on October 31,1957. I am actively looking for old photographs or articles that are relevant to the base. Does anyone know of any good sources?